The unique flowering phenomenon exhibited by the plant Strobilanthus kunthianus is that it produces flowers once in 12 years. Smoking increases carbon monoxide (CO) content in blood and reduces the concentration of haem-bound oxygen. This causes oxygen deficiency in the body. The trait to produce inflated yellow seeds is dominant over the trait producing constricted green seeds. (a) Highlight the role of thymus as a lymphoid organ. (a) State the role of DNA ligase in biotechnology. How do mycorrhizae act as biofertilizers? Explain. Name a genus of fungi that forms a mycorrhizal association with plants. (a) State the difference between meiocyte and gamete with respect to chromosome number. 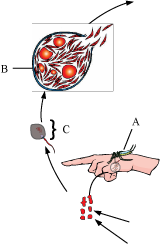 (a) Mention the roles of “A”™ in the life cycle of the malarial parasite. (b) Name the event “C”™ and the organ where this event occurs. (c) Identify the organ “B”™ and name the cells being released from it. The following is the illustration of the sequence of ovarian events (a − i) in a human female. (i) Identify the figure that illustrates ovulation and mention the stage of oogenesis it represents. (ii) Name the ovarian hormone and the pituitary hormone that have caused the above mentioned event. (iv) Write the difference between “c”™ and “h”™. State the aim and describe Messelson and Stahl”™s experiment.